If you are looking for a rugged waterproof point-and-shoot camera then this list is for you. All the cameras on this list can go underwater and survive falls, while most can also withstand freezing temperatures and resist dust. Many of the units are also compact so you can take them with in any situation. Prices range from $100 up to about $400. To determine the ratings of these models we compared image and video quality, ease of use, features such as GPS and WiFi, size and weight, price and more. Below we review our top 5 choices for the best waterproof digital cameras. Go to the bottom of this article to see a comparison chart full of specs. Our pick for the best waterproof digital camera is the $379 Olympus Stylus TG-4. The 16 MP sensor, 4x optical zoom lens, fast focus and performance, and solid image stabilizer make for very good photos. The f/2 aperture is much better than other cameras in this class for low light images, although photos can be a bit noisy. The Stylus TG-4 is waterproof up to 49 feet, while it can survive a fall from 7 feet. Other nice features include an excellent LCD, built-in GPS and compass, HDR settings, and RAW mode (the only model on this list that supports RAW mode). About the only negative we found is that, while the Olympus Stylus TG-4 does take full 1080p HD video, the quality is just average and the sound is not very good. However, overall if you are looking for the best rugged camera that supports RAW mode or just takes quality photos then the TG-4 is for you. 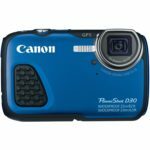 One of the deepest waterproof cameras available is the $299 Canon Powershot D30 which can survive depths up to 82 feet while also being able to withstand drops of up to 6.5 feet. It measures in at 4.3 x 2.7 x 1.1 inches and weighs 8 ounces. With a 12MP 1/2.3″ BSI-CMOS sensor and 5x optical lens with image stabilization the image quality is pretty good, but a bit grainy at times. The 1080/24p video quality is also decent and can record super slow motion video at 640×480. It has GPS capabilities so you can geotag your photos. A handful of users have complained that it leaks under water right out of the box. So if you choose this Canon model we recommend testing it in water before you take in on vacation with you. At about $150 the Fujifilm FinePix XP90 is much cheaper option for a rugged digital camera and rated as a Best Buy by the leading consumer magazine. It is waterproof to 50 feet, shockproof from up to 5.8 feet, freeze-proof to 14°F, and dustproof. Picture quality is good, but not great, thanks to a 16.4MP 1/2.3″ CMOS sensor, 5x optical zoom lens, and image stabilization. Other features include full HD video at 60 frames per second with movie recording button, 480 fps slow motion mode, HDR capture, 360° motion panorama, wireless connectivity, and it is available in 4 different colors. The battery life on the FinePix XP90 is below average and while the photos are decent, they won’t compare to a higher end camera, especially in low light. However, for those you looking for an affordable waterproof camera then the Fujifilm FinePix XP90 is perfect for you. The most compact and lightest waterproof camera is the Panasonic Lumix DMC-TS30 which sells for about $135. With a 16MP sensor, 4x optical zoom lens, and image stabilization the Lumix DMC-TS30 takes decent photos in good light, however it struggles in low light settings and in flash photos with grainy images. The Panasonic Lumix DMC-TS30 is freeze-proof to 14 degrees, shockproof from 4.9 feet, and waterproof down to 26 feet. It captures 720p HD video that is of lower quality than most models in this class. If size and weight are your primary concerns in a rugged digital camera and you will only use it in daylight then we would recommend the Panasonic Lumix DMC-TS30, however there are better options for most situations. One of the best-selling digital cameras on Amazon is the 106.95 Nikon Coolpix S33. We have seen it for sale for as cheap as $99 and at that price the Coolpix S33 would rank as the best waterproof camera under $100. It is waterproof up to 32 feet deep, shockproof up to 5 feet, and freeze-proof down to 14° F.
The photo quality is decent, but far from excellent or even very good. It has a 13.2 MP CMOS sensor and 3x NIKKOR zoom lens. It captures 1080 30p HD video which is actually pretty nice compared to other models in this price range. Since it is a budget waterproof camera, it is lacking some features that other models have like Wi-Fi and GPS. Also its image stabilizer is poor and its start-up time and overall performance is slow. We would recommend the Nikon Coolpix S33 if you are looking for the cheapest waterproof digital camera or to give to a child to use on vacation or other outdoor adventures.